Thai Chili Sauce, as a dipping , can be a bit overly sweet so I normally use it as one of the ingredients for cooking dishes that needs savory for this dish. With garlic and a bit of fermented black beans, this dish turned out so delicious that Jo wished she could have the whole dish to herself ..ahemm the Momsie loves it too but once again becoz it is artery clogging for me, I took a few only. :p This truly whets one's appetite and we have second helpings...the gravy infused into the mussels....whoa I can have two helpings of hot steamed rice ! Heat up the wok, add in 2 tbsp olive oil , put in the prawns and stir fry till half cooked. Add in the mussels and continue to stir fry till cooked. Push aside the shrimps and mussels , add in the remaining olive oil and saute the garlic and fermented black beans till fragrant, add in the thai chilli sauce and stir fry till well combine. Push back the shrimps and mussels and stir fry till well coated with the fragrant sauce. Add in thickening and stir fry till well combined. Add in a bit of hot water if required ( if more gravy is required ) . Add in the coriander and dish up . Serve with hot steamed rice. Enjoy and have a great weekend ! 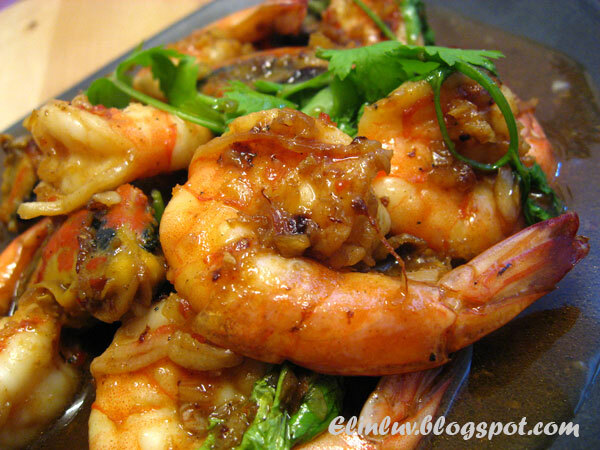 I am prawns fan...Thai chilli sauce makes the dish sound even better! 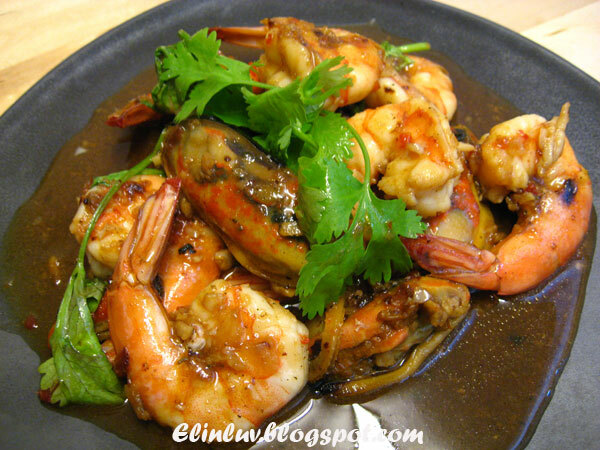 Thai seafood dishes are superb! I love this dish. Wooahh! This is very appetizing dish. It makes me feel hungry now. I love prawns too! Mind to share some? OMG...that looks so good....your pics are amazing....too good, now I'm craaving shrimp!! There's no such thing as too much seafood is there? Lovely dish! Fantastic pictures. Simply amazing with this terrific sauce! Thai style shrimp! That is one of my favorites. I love that you mix&match fermented beans and sweet chili sauce! what a great idea! The sauce looks amazing! How I wish I can have seafood everyday too! 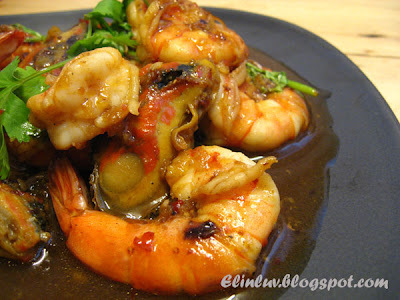 Wow, what a nice seafood dish...great combination of mussels and shrimps...love Thai chilli :-) Great pictures as well! Wonderful dish! 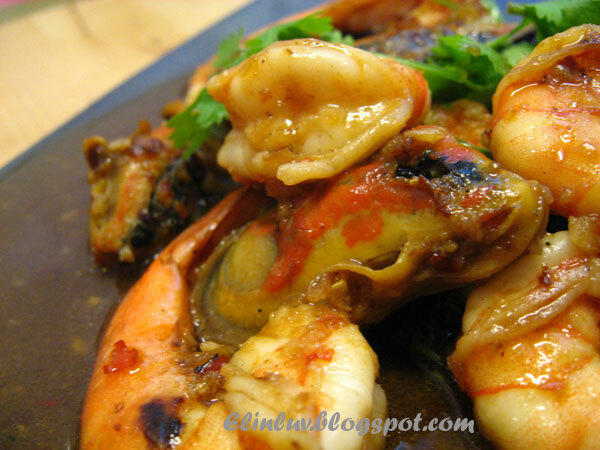 The Thai chilli sauce would highlight the flavors of the mussels and shrimp really well. Chef Dennis...heehee I managed to make you crave for shrimps ! Sonia...yess it is delish ! 5 star foodie...: ) yup delish ! Biren...haha but at times I forget my age and think I am as young as the kids ! Tanantha...these two ingredients complement each other well. You will love it ! CC...yup the thai chilli sauce enhanced the flavor of the mussels and shrimps...delish and interesting sauce ever for seafood. Is only 10 something in the morning here and I am already hungry. This dish will be great for my lunch. I too find the Thai Chili sauce a bit too sweet for me. I still prefer to use our Lingham. 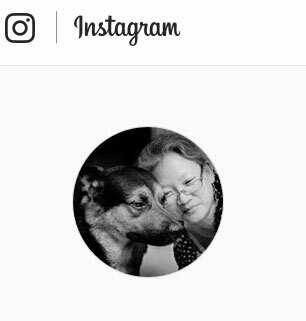 By the way, Happy Mother's Day!! Be honest this is the beat Thai chilli seafood I have ever seen. The ones in restaurant always look not this fresh. Love the recipe so I will try the fresh seafood at home. I wish I had mussels in the house now so I could make this for dinner. This looks delicious and I DID salivate all over my keyboard!